1. Put a drop of methylene blue on a slide. Caution: methylene blue will stain clothes and skin. 2. Gently scrape the inside of your cheek with the flat side of a toothpick. Scrape lightly. 3. Stir the end of the toothpick in the stain and throw the toothpick away. 4. Place a coverslip onto the slide. 5. Use the SCANNING objective to focus. You probably will not see the cells at this power. 6. Switch to LOW POWER. Cells should be visible, but they will be small and look like nearly clear purplish blobs. If you are looking at something very dark purple, it is probably not a cell. Sketch the cell at low and high power. Label the nucleus, cytoplasm, and cell membrane of a single cell. Draw your cells to scale. 1. Why is methylene blue necessary? 2. 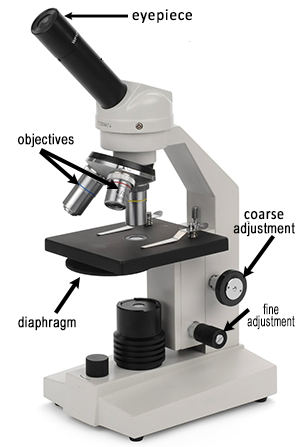 The light microscope used in the lab is not powerful enough to view other organelles in the cheek cell. What parts of the cell were visible. 3. List 2 organelles that were NOT visible but could be found in cells if you had a microscope with a better magnification. 4. What does it mean to draw a cell "to scale?" 5. Keeping in mind that the mouth is the first site of chemical digestion in a human. Your saliva starts the process of breaking down the food you eat. Keeping this in mind, what organelle do you think would be numerous inside the cells of your mouth?